The School for Student Leadership Program and Year 9 students at the Snowy River Campus at Marlo featured in a segment on ABC News, aired Sunday March 5, 2017. A wilderness adventure experience for Victorian public school students has been so successful it looks set to be expanded, giving more teenagers the chance to learn outdoor and leadership skills. They would be in addition to the three existing campuses: at Marlo in far east Gippsland, Mount Noorat in the western districts and Dinner Plain in the Victorian Alps. There are no regular classes at the schools. Instead, the students participate in outdoor activities, classes on problem solving and leadership activities. "If building other campuses was driven by data alone, then we would have ten more campuses," Marlo campus principal Robyn Francis said. Approximately 540 year nine students are selected from public schools around the state every year to attend one of the campuses for approximately ten weeks. However that only works out to roughly 2 per cent of Victorian public school year nine students. 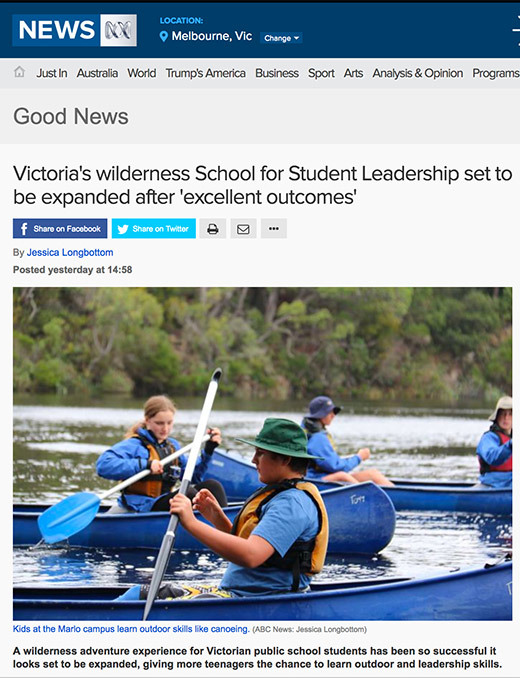 "Victoria's wilderness School for Student Leadership set to be expanded after 'excellent outcomes'"
Gnurad Gundidj Campus is on Twitter and will broadcast news, highlights and pictorial snippets from the School Community of Gnurad during Term 4, 2015. Parents are encouraged to follow @GnuradGundidj to get regular notifications including links to latest articles and new posts on our website as well as general items for the School for Student Leadership. A huge congratulations to the boys (Peter, Sosaia, Noah and Chaise) from Robinvale P-12 College for completing their CLP! They raised just over $1000 for the Legacy foundation in their area. A huge well done to the boys from T4-2013. On Wednesday 25 June, Noah, Peter, Chaise and Sosaia proudly presented Mr Bill Vandenberg, President of the Robinvale Branch of Legacy with a cheque for $1046.40, the total raise by the boys following their very successful 'Legacy Disco'. Mr Vandenberg, on behalf of Legacy, thanked the boys for raising such a significant amount of money which will go towards improving the Legacy Flats in Latje Road, Robinvale. Congratulations once again to Noah, Peter, Chaise and Sosaia on this wonderful achievement! 1B in the local paper for raft building. Looking like they had a great time. School for Student Leadership’s Gnurad Gundidj campus students make a triumphant launch at Lake Pertobe for their self-built raft, despite being drenched from above. THIRTEEN Warrnambool students will join war veterans at Gallipoli next year to take part in the Anzac Day centenary period commemorations of the historic campaign. Brauer College student Harry Twyford and Warrnambool College’s Emily McCullagh study a map with Turkish Consul General Mehmet Apak ahead of their trip to the country next year.